Singapore has romantic destinations that provide chances to woo your partner, whether it is a romantic dinner with a view of the city or a leisurely walk under the moonlight or city lights. There are attractions and fun things to do in Singapore that will make your girlfriend or boyfriend fall in love with you all over again. Instead of the usual candlelight dinner, why not visit Sentosa for a fun and enriching day out? 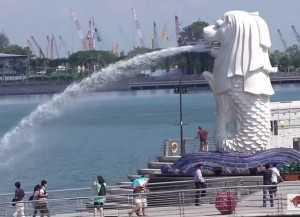 The Merlion combines history, culture, and a beautiful view of Sentosa in one attraction. Climb up the iconic statue and enjoy the breathtaking views. Learn about the importance and the myth behind Singapore’s icon. Chime the Prosperity Bell and get a Prosperity Coin to bring in fortune into your budding relationship. Dine in one of the cafes to replenish your energy for an afternoon of exploring Palawan Beach, enjoying the rides at Universal Studios, and other destinations on the island. Head up to the Esplanade Roof Garden for a romantic night. Have a picnic in the garden and enjoy spectacular unobstructed views of One Fullerton, Marina Bay Sands, and the Singapore River. And if the night is young, have a drink in some of Singapore’s best bars. The futuristic Gardens by the Bay area is a perfect romantic destination for lovers. Take a long walk as the Supertrees paint the night sky in different hues of blue, orange, red, and yellow. Make the night special by walking over the bright trees on the sky bridge. If you are looking for a majestic sunset, head to Mount Faber. The awe-inspiring view of the skies turning from a soft blue to a radiant orange makes for a romantic way to end the day. Singapore has special places where you can share intimate moments with your special someone. These are just a handful of places to create lasting memories. Be the first to comment on "Top 4 Date Destinations in Singapore"